TRY OUR NEW AND IMPROVED GLYCERIN FORMULA!! 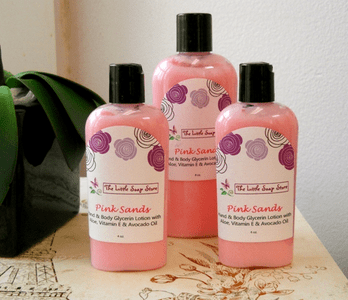 Our handcrafted lotions are infused with fine, wonderful ingredients that will leave your skin supple and soft. Unlike commercial products that are only surface deep, our lotions are formulated to deeply penetrate the top layers of skin and provide immediate relief to dry, itchy skin. We dare you to take our challenge and compare our lotions to the most popular brands. In the end, you will see that the dramatic difference in our products because of the plethora of natural oils, skin butters, and extracts that we use.